Men’s sweatpants, track pants and joggers are a comfortable option for the gym, traveling, or just lounging. To find softest and most natural to wear styles, you are going to want to pay attention to fit, fabric, the waistband, and style of the pant. Since you can pretty much wear sweats almost anywhere these days, it is easy to find options that are not only comfy to wear at home but are stylish enough to wear in public. 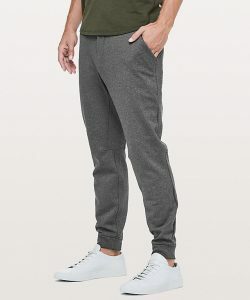 Lululemon sweatpants are insanely popular, party due to their extreme comfort level and party because of the quality and innovation of the fabric that they use. 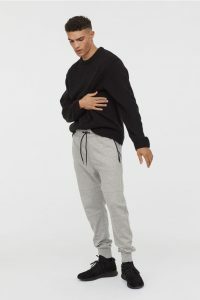 Lululemon has many different styles of track pant, with various weights of material and unusual design features, with their City Sweat Jogger being one of their best all-around options. If you know anything about Lululemon you will know that their clothes aren’t exactly cheap, but the brand has a very loyal following, with some people loving them so much they hardly wear anything else. What makes the City Sweat Jogger a good option if you are looking for comfort is the very soft fabric that will keep you warm, while also wicking sweat away and keeping you fresh if you wear them for a workout. They are also known for maintaining the shape of the design, especially at the knee. Overall they are comfortable, warm, and relatively fitted which makes them easy to wear at home or while you are out running errands. 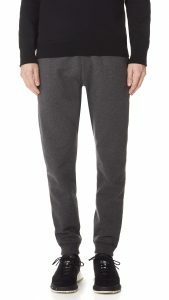 A good quality, budget option that is worth checking out are Uniqlo’s Sweatpant. These sweats are known for being very well made and good at keeping their shape throughout the day. They are made of a thick material that is great for colder weather, and that has a cotton type of fleece lining that is very soft to the touch. They are a reasonably traditional cut, with a slightly slim fit, straight leg. The style is basic enough to go with other clothes and to be worn in various situations. They aren’t overly loose or too fitted on most body types, and they come with a sturdy waistband, so you shouldn’t have any issues with the pants drooping down. If you prefer a slimmer fit, Uniqlo also offers a dry stretch style that is a little bit more fitted. The Dry Stretch is designed to wick moisture and dry quickly. Reigning Champ makes some of the best sweatpants (and hoodies) around. They can be a bit expensive, but the feel and design are very high quality, and most men who are fans of Reigning Champ say that the high price is worth it. They are made in Canada, are a classic slim fit cut, and come with hip and back pockets. Since they are made from midweight terry cotton, they make an excellent everyday option since they won’t be too hot or too cold for an average day. The trim fit is super fashionable, not too skinny, and comfortable to wear out in public. They are generally regarded as a bit more polished than most sweats styles, so they also make a great travel pant. If you are buying as lounge pant, you may want to consider sizing up for extra comfort. If you order these online, be careful on sizing as they run about a size smaller than other brands. 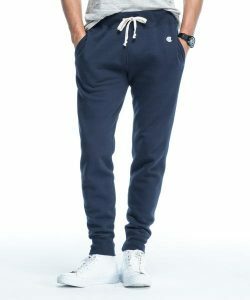 The Men’s Soft Touch Jogger from the C9 Champion® line sold at Target is an excellent option if you aren’t looking to spend a lot of money, but are still looking for a style that is easy to wear and look good. The entire C9 Champion line is well worth looking at for the great selection of different styles and fabrics that work well for all body sizes and most tastes. The other great thing about this line is that a lot of styles often go on sale for under $20. 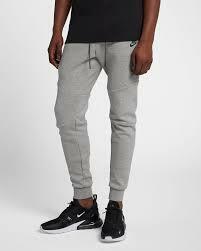 One of the most popular track pants, especially for the younger set, is the Nike Tech Fleece Joggers. These are made with a lightweight fabric that is great for working out in since the breathable nature of the material means you won’t sweat or if you do, the sweat will be wicked away so you won’t feel it. Despite being very tapered, the Tech Fleece is designed so that you can move in it. Some of the cool design features include a substantial zippered side pocket(along with the regular side pockets) and a dropped gusseted crotch, which isn’t for everyone, but a lot of men love this feature. As you can probably tell from the picture, they are a slim-fit, so if you are buying for comfort, you are probably going to want to be careful with sizing and maybe size up. Nike seems to have had some quality control issues with the fabric on the Tech Fleece Jogger last year that has now been resolved in the latest version. The Todd Snyder Slim Jogger is a popular higher-end option. The price is pretty high, but as with some of the other high-priced options on this list you are paying for quality fabrics and design features. 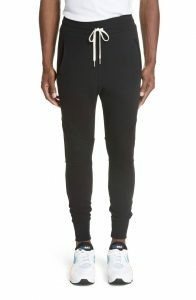 Quite a lot of reviews describe this style as the perfect sweatpant, even among the more expensive brands. The reason for this is that the fit is perfect on most men since they are neither too slim or too baggy. They are also noteworthy for the fantastic quality of the material. The other thing worth noting about the Snyder Slim Jogger is that they have a durable feel to them, so they should last a while, and you should be able to get a decent amount of use out of them. Bonobos are a brand that is building their reputation by creating men’s clothes that fit well and that are comfortable. So it is no surprise that they make some great fitting, soft sweats that work well for many different body types. 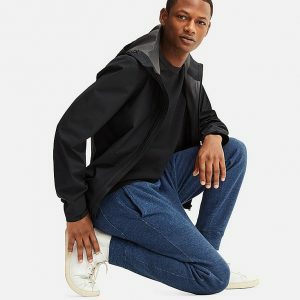 The Bonobos sweats are made from 50% polyester, 38% cotton, and 12% rayon. The rayon is a nice touch that helps to add to the softness of the fabric. Like most track pants, this style has an elastic waistband, but it also has the added feature of a drawcord so that you can get a custom fit. It also features two side pockets and a back patch pocket that blend in well with the overall design and don’t add a lot of bulk. The great thing about Bonobos clothes is that they come in lots of sizes and colors and you can get them in fits from skinny to relaxed. Like a lot of sweats on this list, you can wear them around the house, but they are also stylish enough to wear outdoors and not feel self-conscious. AE do an outstanding job making comfortable clothes and their joggers are no exception. They sell two fleece joggers, a regular and a lightweight. The regular is thick enough to wear when cold, but not so thick that you couldn’t wear them comfortably during spring/fall type weather. The lightweight option is better for milder weather, but not for hot summer weather. The fabric is 90% Polyester and 10% Spandex, so they aren’t quite as breathable as some cotton designs. You may find that you sweat a lot in them if you are wearing them for working out, but for most activities, they should be fine. Both fabric weights are very soft, comfortable and they have a little bit of stretch to them, but they won’t lose shape as the day goes on. The waistband has a drawstring, the pockets all have zippers, and they wash/dry well. H & M are a surprisingly reliable store to get pretty good quality, budget sweatpants that fit most body types reasonably well. 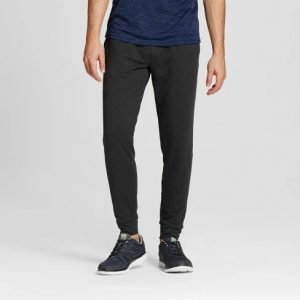 The H & M joggers are stylish, comfy, and come in 4 colors that you can get for around $30. They have a zippered side pocket with a dropped gusset, and tapered legs. The legs have seams at knees that can help with a range of movement and are a little bit like the Nike Tech Fleece listed above but not as tapered. 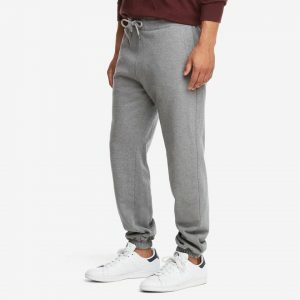 If you aren’t into the jogger style, H& M also offers an excellent range of classic regular, skinny, and slim fits that you can usually get for $20 or less. They come in many colors, with some being 100% cotton and other being a cotton polyester blend. 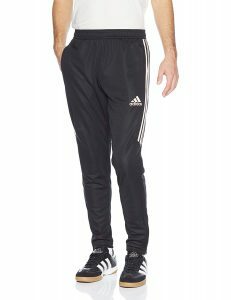 You see the favorite Adidas Tiro soccer pants everywhere, and despite being designed as an athletic soccer pant, they seem to have become the official casual uniform for men. The popularity stems from the versatile look and the light, breathable fabric. They are a pretty slim fit, and unfortunately, the Tiro doesn’t work for some body types. If you have muscular calves, you will probably want to avoid this design (although they do have zippers on the calf if you need to loosen them up). The inseam can also be a bit long for some men. If you are an average build, the Tiro can make an excellent option for the gym and for exercising. Another brand that has a reputation for producing comfortable clothes is Barbell, so their joggers are worth a look. 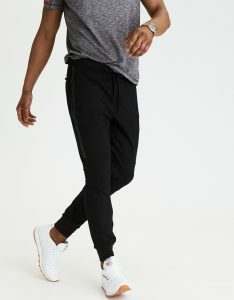 The joggers are a very skinny fit, but they have some stretch to them, so they allow for full range of motion in the leg if you are looking for a good option for working out. The Barbell Jogger is partly known for the high quality of the fabric, that is not only comfortable but also washes well. What men seem to like about this jogger is that the fit is very flattering because there is no bulk or excess fabric. They are also loved for their ability to move well with the body, so if you are working out, they don’t pull or ride up in weird ways. 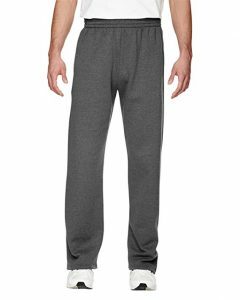 If you are looking for heavyweight cotton sweatpants, look no further than American Giant. It is an excellent choice for colder winter days, where you want to be warm and cozy. These sweats have a couple of features like metal-tipped drawcords, a back pocket and a channeled waistband that are worth noting. Most reviews mention that they are very high-quality sweats, that feel very well constructed and seem like they will last for a long time. 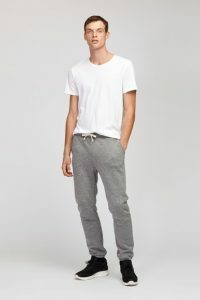 For those who are just looking for basic sweatpants that are cheap, fit relatively well, and that you can wear for hanging out at home, this style from Fruit of the Loom will probably work well for you. They are a mid-weight fabric that feels soft, sturdy, and will wash and dry fast. You can get them with either straight leg or an elastic bottom; it depends on the color that you choose what the cuff style is. They have quite a thick waistband with a single loop drawstring, which is helpful to stop them from falling at the waist. They also have nice deep pockets to keep your possessions safe and secure. Since they are fleece, you will find them to be a great option for winter, but too hot for the summer months. John Elliott makes premium men’s basics that are usually quite tailored, stylish and modern. Their Escobar Sweatpant is a slim fit, drop crotch that is very tapered from the knee down. They probably aren’t for everyone, but if you are super stylish and don’t mind spending a bit of money, you will probably love this design. The Escobar are made in the U.S.A, have a zipper on the back pocket, and the fabric is a soft cotton fleece that is 75% cotton and 25% polyester.